Andrzej Zarebczan of Clifton, entered eternal life on Wednesday, April 25th, 2018, he was 72. Andrzej was born in Gronkow, Poland on October 28th, 1945, to Stanislaw and Regina (Hareza) Zarebczan. He came to the United States on December 6th, 1973, and settled in Clifton. On June 15th, 1975 he married his beloved wife, Anna (Kalata) Zarebczan. He retired from Swepco Tube Corp, four years ago, having worked as a machine operator there for over 40 years. Andrzej was a quiet yet strong man who enjoyed the company of his family, especially his grandchildren. He also enjoyed smoking kielbasi, reading polish newspapers, spending vacations with his family and being an all around handy-man. Andrzej is survived by his beloved wife Anna, his devoted children Maria and her husband Mariusz Ruszala and Stanley Zarebczan. He is also survived by his six cherished grandchildren Nick, Gabbie, Michael, Lilia, Andrew and Amy; his two sisters Anna and husband Marian Bryja and Maria Nowak; his two brothers Stanislaw and wife Zofia, and Jan and wife Anna Zarebczan. Andrzej was predeceased by his granddaughter Abbygail. Visiting 5-8 pm, Friday, April 27th, 2018, Warner-Wozniak Funeral Service, 80 Midland Ave. Wallington, NJ. A funeral Mass will be celebrated , Saturday, April 28th, 2018, (time to be announced) St. Joseph's Church 7 Parker Ave. Passaic, New Jersey 07055. Interment will follow at St. Mary's Cemetery, Saddle Brook. Flowers or contributions to St. Jude Children's Research Hospital are appreciated. 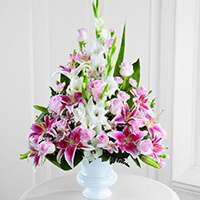 To send flowers to the family of Andrzej Zarebczan, please visit our Heartfelt Sympathies Store. We encourage you to share any memorable photos or stories about Andrzej. All tributes placed on and purchased through this memorial website will remain on in perpetuity for future generations.